A cool crazy mom can be a beautiful and terrifying woman. An inspired moment of insanity can remind your children who’s really in charge and that’s a lovely thing. As parents, sometimes we work so hard at remaining sane we forget the importance and power of crazy. As a result four and five year old kids push us around like grocery carts. We want our children to be happy and healthy and normal and we don’t want them to be spoiled or mean. So we try to be civil and kind and patient…all the time. Maybe that’s not a good thing. Becaue we don’t want our kids to be nuts so we avoid doing anything that suggests crazy behaviour is ok.
My ex-husband used to call it “the rich glint of lunacy.” I still love that line. Remember some of the most inspired and brilliant men and women of science, art and literature were toe sucking crazies. So, maybe we shouldn’t down play it’s importance too quickly. But before you start throwing crazy behaviour around like bird seed, remember a little bit goes a long way. 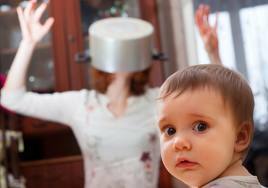 If you’re crazy all the time everyone, including your children, will just shrug, dismiss and avoid you. They will be unfazed and unimpressed, no matter how off the wall your actions are. A person who is constantly crazy becomes boring and bothersome. (Trust me I know this from first hand experience). In the exact same instant, Jack and Mary both started whining and complaining. There was a chorus of “Oh man, what a rip off! We have this toy. This stinks. I hate Burger King.” This was followed by much sighing and groaning that seemed to go on and on and on. I could feel my throat constricting with annoynace, disapointment then anger. “Ok, put all the stuff back in the bag,” I said cheerfully. “Ok cool!” they started shoving their Happy Meals back together. They put the still warm bags of food into my hand, happy because I was going to return to Burger King and get new toys. A traffic light turned red and I stopped then I rolled down my window and threw the bags out. Jack and Mary both gasped but did not speak. “Yes ma’am” was all they said and we drove in silence. Once home, I fixed them peanut butter and jelly sandwiches. They never whined or complained about a Happy Meal or fast food toy again. Sometimes, a single act of insanity has lasting power and tells kids there is a line that should not be crossed. And if they do cross that line, they might be surprised by the results.